The WSOP isn’t just about the WSOP … you have tournament options of notable field sizes and different game varieties all across town. While Aria has opened an entire new section for dailies, Bellagio cleared a section for tournaments and TV cameras and Binions made way for more tables, too. There’s a summer “classic” at Wynn and the Deep Stacks Extravaganza is back at Venetian, while Golden Nugget and Caesars Palace gear up for the Grand Poker and Mega Stack series’ respectively. Need help deciding what, when, and where to play throughout the summer? This handy spreadsheet breaks down all the big tournament action — with details on buy-in, blind structures, and rake so you can choose the best brick-and-mortar MTT. In the midst of a so-far unprofitable weeklong stretch of daily tournaments around Las Vegas, I decided to try my luck+skill next at the Orleans (a grizzled locals favorite), the Golden Nugget (for a tourist-packed short-stack event), and the Venetian for a little Deep Stacks Extravaganza with hoodie-and-headphones set. Each tournament has its own appeal, and gave me quite a taste of the broad range of game selection across town. 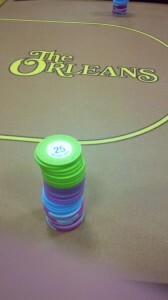 Friday night’s 12,500-chip starting stack at The Orleans. Those on the lower-stakes Vegas grind often rave about Friday night at The Orleans. Large field, good structure, big prize pool. A friend advised that I arrive early because the event fills up so quickly. I parked around back almost an hour before the 7pm start time, and after securing my $125 entry, sat at a bar near the food court with T.G.I. Fridays, Fuddruckers, Baskin Robbins, Sbarro, Subway — yeah, real Cajun cuisine. On this night there would be 270 players, with first place paying about $8,000. The floor supervisor said re-entries were possible but improbable because of a long list of alternates. As we got underway, two locals spoke conspicuously about a mutual friend who was playing a $250k buy-in event in Australia (the Aussie Millions high-roller event, won by Phil Ivey). Of The Orleans’s comparably tiny entry fee, $100 goes to the prize pool, $2 goes to tournament “players of the month,” $13 goes to the house and $10 goes to staff. The tournament can often last until mid morning, but my run in the event would be a quick one, as I never dragged a pot and busted 5 minutes before the first break. The United States Government. Check back next week to see if anything changes. In all seriousness, the last week and a half has been a dark one for the industry, and last week didn’t necessarily feel like the appropriate time to recognize the few people who were fortunate enough to make a few dollars in poker. We must, however, realize that no matter how bleak the situation is with online poker, the live game will continue to go on. The numbers will change, how yet we don’t know, but as long as there are people playing cards, there will be winners and losers. And some version of this column. It was big news for all of about 14 hours, but there’s no disputing the incredibly impressive accomplishments of Vanessa Selbst and Jason Mercier at NAPT Mohegan Sun. The next day was Jason Mercier’s opportunity to repeat history. His 2010 effort was a $25,000 event that drew 35 players, and paid him a juicy $475,000. This year’s high roller lowered the buy-in to $10,000 but drew more than twice as many players (78 to be exact), and again Mercier won his first table to put himself in contention. He reached heads-up play against fellow Team PokerStars Pro member Eugene Katchalov at a slight disadvantage, but quickly erased it. When the final river hit the felt, Mercier had completed the highly unlikely exacta with Selbst and accumulated $246,600 between bounties and his first place prize. For their sake, lets just hope they didn’t get paid out via their PokerStars accounts. Erik Seidel’s accomplishments thus far in 2011 can be put up against any individual year by any player in the history of the game, and the year’s less than 1/3rd of the way done. To put things in perspective, 4 of the top 5 top money accumulators are the top four finishers in the 2010 WSOP Main Event, the only anomaly on the list being Seidel. So when the final table was set at WPT Hollywood, Seidel was a prohibitive favorite, and by the time he got down to heads-up play with a part time player from Cincinnati, most of the media already had their reports typed up with their finger hovering over their mouse, ready to click send. Perhaps we should have taken the events that took place in Indiana in to account when trying to make sense of the pokerpocalypse. Just 97 players showed up for a WPT event, the most famous ginger in poker quite literally abandoned her roots, and in the end, the stranglehold that Erik Seidel has held on poker was loosened, if only slightly. Mike Scarborough played an impressive tournament, and succeeded in overcoming a tough final table on his way to a $273,664 payday. In my last tournament recap, I mentioned La Sengphet had made her second final table at WSOPC St. Louis, and right after I posted she won the tournament for over $17,000, giving her her second ring of the season. I added a bit at the end to recognize it, and Dan put up a post congratulating her. In it, I mentioned Kyle Cartwright as one of only two players to win two rings at the same stop this season, both of his coming in Tunica. He won a final table that was going on concurrently to La’s, which just happened to be the Main Event in St. Louis. 449 players showed up for the $1,600 tournament, generating a sizable prize pool that would award over $142,000 to the eventual champion. On this day, Cartwright was indeed that man, adding a third ring and an automatic seat in the $1 million championship to what is likely the most impressive resume on this year’s WSOP Circuit. Amidst the chaos that enveloped the poker world on Friday, a couple of the best that the American poker media has to offer (Shamus and Pauly) soldiered on with their reporting duties. As usual, their updates were top notch and captured the compelling action well, and it was some exciting play to be sure. Local Peruvian player Kemal Ferri went on a rampage when play got down to four-handed, eliminating all three of his opponents on the way to his first LAPT title and $207,400. The unofficial rule amongst the poker media is not to openly root for any one player at a final table. That rule is usurped by the fact that all media subconsciously roots for the big stacks to win during the big confrontations in order to facilitate an early exit from the casino. It is by this that we can judge Michael Kanaan the most popular player of every member of the media present for his win at ANZPT Sydney. The prohibitive chip leader entering play, Kanaan triumphed over his final eight opponents in less than four-and-a-half hours of play, sending people home at just after 5 pm after collecting his $195,714 first place prize, of course. So much for sharing the wealth. Yet another player added his second WSOP Circuit ring of the season this past week as action moved to Caesers in Las Vegas. Army veteran Jessie Bryant’s job while he was enlisted was similar to the soldiers who were featured in “The Hurt Locker”, but these days his focus has been directed more towards the game of Omaha. Bryant won an Omaha-8/b event a few months ago in Tunica, and to show off the versatility in his skills he decided to change it up a bit in Las Vegas, adding a PLO championship to his poker resume. He is the early leader in the player of the series race in Las Vegas thanks to his score of just under $10,000. Also well underway in Las Vegas over the past couple of weeks has been the latest incarnation of the Venetian Deep Stack Extravaganza. Well-known pros have been scattered amongst the lists of those who have cashed in the events held so far, but have began to pop up more and more since the madness of Friday. The most well-known of those players is Chip Jett, who for a long time has been one of the red-named players on Full Tilt. Not content to sit and stare at a blank computer screen, Jett decided to enter Event 20, a $340 No Limit Hold’em event, and promptly won the whole thing for just under $14,000. Jacob Zalewski’s charity tourney FTW! Not to be dismissive of all the good work poker can do, but in Las Vegas, charity tourneys can begin to seem a dime a dozen. Just about all charity tournaments promise “celebrities”, but few deliver. In the world of big-time charity events that consistently do, you’ve got Ante Up for Africa, the big $5k buy-in event at the WSOP, and, maybe Jennifer Harman’s event for the ASPCA. But one of the best opportunities to play with celebs for a decent price (and a great cause) is at the “All In for CP” 3 charity event, which takes place today at the Venetian at 4 pm PT. The tournament raises money for the One Step Closer Foundation, an enterprise started by Jacob Zalewski when he was in college. Though the ultimate goal is to find a cure for cerebral palsy, the immediate goal is to allow people with CP to live more normal lives. Many of you who have spent time at the Rio during the last few World Series’ have certainly seen Jacob riding around the halls on his scooter. This event does not lack in star power, as celebrities have taken down this event in the last two years. First it was actor Mehki Phifer, then last year Simpson’s co-creator Sam Simon won and generously donated the entirety of his winnings. This year’s event will also feature appearances by Shannon Elizabeth, Jennifer Tilly, Montel Williams and WWE Diva Alicia Fox, amongst others, as well as dozens of poker pros including Barry Greenstein, Phil Laak, Dennis Phillips, and Antonio Esfandiari. As was previously stated this tournament is happening TODAY at 4 PM. Information about the event can be found on Facebook here and on the All In For CP website here. If you’re in the area you should definitely consider heading down and anteing up for this worthy cause.